Dr Kancha Ilaiah, associate professor of political science at Hyderabad's Osmania University, is known for his fierce attacks on Hindu religious and political leaders. In 1996, his first book Why I am not a Hindu was accused of inflaming communal passions. Last month, he published another controversial tract, God as a Political Philosopher: Buddha's Challenge to Brahminism. Dr Ilaiah, 48, says his tirade against Hinduism stems from the inhuman and humiliating caste-ridden conditions in which he was born and brought up. Born in a backward caste family in Andhra Pradesh's Warangal district, he was lucky to get a university education because of the reservation system. "I am a product of the post-Independence rural caste whom Brahminical forces wanted to destroy. So I will continue to agitate against Hinduism," he says. In an interview with Senior Associate Editor George Iype, he explains why he harbours so much anger against Hinduism. What is God as a Philosopher: Buddha's Challenge to Brahminism about? This book deals with the struggles that Buddha carried out against Brahminism in India. In India, there are two streams of religious thought: the dalitbahujan and brahminical streams. In the ancient world, actually at the time of the formation of Brahminism, high caste Brahmins tried to divide society into caste. That was when Buddha was born. Buddha was basically a non-Aryan and came from a tribal background. He felt the Brahminical restructuring of society was going to destroy the edifice of India. So he began to search for an alternative, both in the philosophical realm and in civil society. My book deals with Buddha's struggles against Brahminism. The book captures the whole argument that Buddha himself developed against the Brahminical order. Why are you a ferocious critic of Hinduism? My criticism has grown out of my experiences and convictions in life. The Hindu religion and the Hindutva movement describe all Sudras, Chandalas and Adivasis as Hindus. That is wrong. I come from an Other Backward Class family called the Kurumas. The question is if I am a Hindu, my parents should have known that they were part of a particular religion. But they never knew whether they belonged to the Hindu religion. Hinduism never initiated me or my people into its religion. We do not wear the threads, we cannot become temple priests, we do not have childhood formations like Brahminical children. Moreover, if I belong to Hinduism, I should share the food habits and ritual symbols of that religion. We do not share them also. So, in your opinion, OBC Hindus do not believe in Hindu religious texts? OBC Hindus cannot believe in the religious texts for various reasons. Take Hindu religious texts like the Rig Veda and Bhagwad Gita. According to these books, the Sudras were born from the feet of God and the Brahmins from the head. So if we were born from the feet, how do we go towards the head, which belongs to the Brahmins? I believe the Hindu religious texts are not divine. They did not come from God. Brahminical forces deliberately wrote these religious texts showing the entire Sudra community as their feet boys. This is a very dehumanising proposition. And the tragedy is there is no way that we, the lower caste people, can escape from the tyranny of the Brahmins. Why are you angry with Hindu gods? Look at the images of Hindu gods. They wield weapons. We read that Hindu gods killed our own ancestors. How can I worship the killers as divine? What kind of a religion is it? There are three major religions -- Buddhism, Christianity and Islam. These major religions were constructed by prophets who sacrificed and struggled in life for people's liberation. All these three religions never said that the larger sections of their people were born from the feet of God. So you do not consider Hinduism a religion? Is Hinduism a religion of the stature of Buddhism, Islam and Christianity? In my view, Hinduism is not a religion. It is a cult of worshipping certain violent figures. A religion never worships a violent figure. Religion is a very enlightened social force. Religion is a very civilised thing that came into existence. Religion establishes certain agreements and covenants. Hinduism does not have any divine covenants. Hinduism is a cult of Brahmins, Baniyas and Kshatriyas worshipping violent gods. This cult was constructed against the Sudras, Chandalas and Adivasis. If it is not a cult, but a religion, it should have at least a holy book that gives all people equal rights. Does the Bhagwad Gita give equal rights? In the Bhagwad Gita, God says I have created four Varnas and the Sudra, Chandalas and Adivasis were created to serve the Brahmins. If that is the statement of a God, then I do not consider Hinduism a religion. What is your advice to Hindu religious leaders? I am asking Hindutva forces to liberate the OBCs, SCs, and STs from inhuman conditions. They do not have any religious rights. We can be given religious rights only if Hinduism is reformed. Do you think India cannot be modernised if Hinduism is not reformed? If India has to become a modern nation, it has to Dalitise itself. It has to discover its villages where 80 per cent of Indians, the SCs, STs, and OBCs, live. 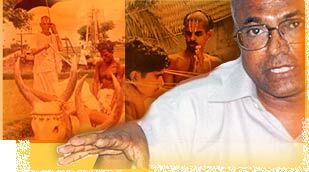 It has to establish an egalitarian relationship between Brahmins and the lower castes. What should Hindu religious leaders do to create such an egalitarian relationship? To begin with, they should sit down with the Sudras to rewrite a true Hindu religious holy book. It should be an egalitarian, spiritual democratic book written by the people's covenants. But again, for that, I think we the Sudras should be allowed to initiate the writing. Because we do not trust the Shankaracharyas and other religious leaders. We do not trust the Brahmin leaders. We cannot trust the sadhus and sanyasis who are going naked at the Kumbh Mela. Can we take those people who walk naked as spiritually advanced people? All these Brahmins in the name of the Kumbh Mela are walking naked before the nation. I am terrified seeing the naked sadhus taking out processions. The sight is inhuman. Is it an enlightened religion? It is these VHP leaders and sadhus who are parading naked who want to take a decision whether the Ram Mandir should be built at the Babri mosque site. This is the greatest tragedy of India. If you are against everything in Hinduism, how would do you describe the religion? Hinduism is basically a spiritual fascist cult. It does not give rights to the lower castes. If the Brahmins want us to become Hindus, they should respect our food, culture and language. Why do Hindu leaders say only vegetarianism is divine? Why do Hindu leaders say prayers should be only in Sanskrit? Why can't I pray in Telugu? Hindutva leader Human Resource Development Minister Murli Manohar Joshi is spending Rs 200 crore to establish Sanskrit schools across the country. Whom will he teach Sanskrit? Let me tell you the statistics. Nearly 90 per cent of Brahmin students in the country are in English medium convent schools. They are sending their children to Christian schools and at the same time attacking Christian missionaries. Why should low caste Hindus learn Sanskrit? Having mastered Sanskrit, do we get the rights to control temples? What then are your struggles for? Our struggle is to have our own religious rights. When we are not Hindus, don't we have the right to embrace any other religions that gives equality? Why are the Brahmins attacking Christianity and Islam? Because there is a possibility that during this era of globalisation, global religions like Christianity and Islam can firmly establish themselves in India. For spirituality and religion, there are no borders. If tomorrow, Hinduism gets established in Europe, will anybody stop it? So when Christianity and Islam are here, why are the Brahmins objecting? Because they fear that the Sudras, Chandalas and Adivasis may get empowered with the new English education that the Christians are giving to our people. That is why they are attacking Christians these days. This is the grotesque conspiracy that Brahminical forces sitting and ruling us from Delhi under Atal Bihari Vajpayee, L K Advani and Arun Shourie have. Do you think the Dalit movement in India is united to to take on the Brahminical forces? We are fighting for equal rights. We are united. I have shown that in my book. Buddha started the struggle against Brahmins. We are continuing it. Now we are talking about our own liberation. The problem is that the Hindutva forces are in collusion with all temple priests, the Shankaracharyas; the VHP and RSS leaders are giving money to SCs and STs to work as full timers. I am now making a case for a global debate between the Sudras and Brahmins. I think Brahmins do not have the right to call themselves Indians. Brahmins are basically Aryans who came from outside. They brought the cow along with them. They were eating the flesh of cows. But they began worshipping the cow as a sacred animal after Buddha took up a campaign saying stop killing animals. Then they said the cow is a sacred animal and it is in the Constitution. Look at the reality. Eighty per cent of the milk in India comes from buffaloes. Buffaloes are the native Indian animals, but they do not have any rights to be protected in the Constitution. Because the buffalo is a Dravidian animal, whereas the cow is an Aryan animal. The buffalo is a black animal and we are black people. We low caste people represent the rights of the buffaloes. Cows cannot be sacred and buffaloes cannot be devilish and yet India can become modern. It is not just possible. All Brahmins in India have been consumers in the history of India. They were never the producers. So, this has to be debated. Are Hindu leaders ready for a debate with you on the points you have raised? No, they are not ready for a debate. Even the Brahmins in the Communist and liberal parties are not ready for a debate. The people in the press are not ready for a debate. Because all these structures are headed by Brahmins. The question is inconvenient to all of them.